The Fantasy Garden Cuff is guaranteed to draw gasps of admiration! Students will have great fun creating this extravagant, luscious bracelet, built around one or a number of focal cabochons. 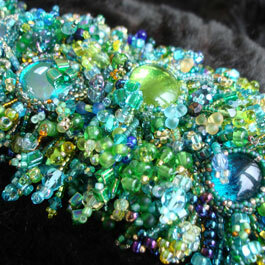 This workshop is also a wonderful way of using up a lot of beads from your stash!